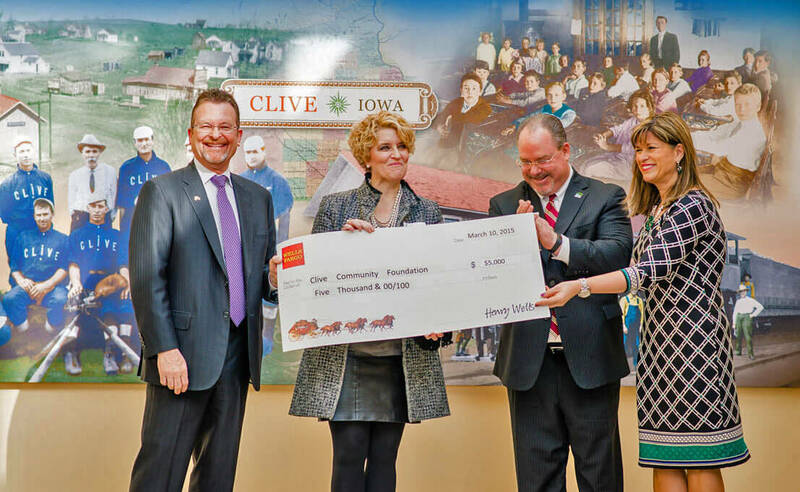 CLIVE, IOWA – April 3, 2015 – About 50 Clive community leaders and Wells Fargo Bank employees recently gathered to see the unveiling of a piece of the past. The Wells Fargo bank at 9801 University Ave. in Clive is the newest of four stores in Iowa to have a historical mural of the community hanging in the lobby. More than 2,000 historical community murals have been installed across the United States. Wells Fargo Lead Regional President Don Pearson, left, and Western Iowa Area President Marta Codina, right, present a $5,000 check from Wells Fargo to the Clive Community Foundation’s Andrea Westmeyer and Clive Mayor Scott Cirksena following the unveiling of the new historical mural in the Wells Fargo bank atrium at 9801 University Ave. in Clive. The mural is 12 feet wide by 5 feet high and features photos from the late 1800s and early 1900s. The centerpiece is the Clive depot, where a Wells Fargo express office was opened in 1910 to serve the growing community. Other photos provided by the Clive Historical Society that are featured in the mural are views of the town from around the 1900s, including images of the railroad, a local baseball team, a group of elementary students, plus historical maps and documents. “It is nice to know that we have business partners like Wells Fargo in Clive that endeavor to tastefully reflect our history and endow our future at the same time – bravo!” Cirksena said. Charlotte-based Beth Currie, who runs the Wells Fargo mural program, said involvement of organizations like the Historical Society is instrumental in helping tell the story of the community via the mural.